What you see here is an ESB R2 carded sample. This particular sample is a production figure and production bubble hand glued onto a 45 back proof card. Arena Offer cards were used for a number of carded samples to have turned up though most I've seen have been sample cards, not proof cards. Sadly, part of the buuble has started to lift on this example but this is to be expected on hand glued pieces such as this. It's amazing that the seal has lasted this long and in no way does something so trivial take away from a great piece like this. 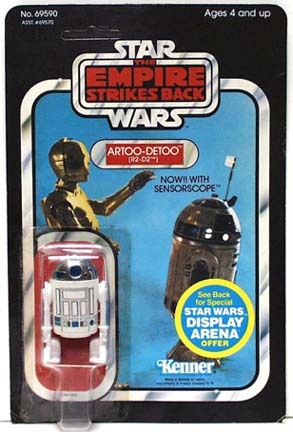 Bryan is an avid R2-D2 collector and this is a great addition to his ever growing R2 collection.